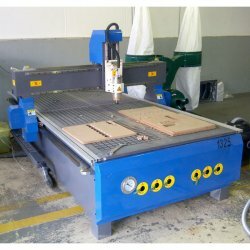 Working with Wood is made straightforward with this simple to use CNC Wood Router from Advanced Machinery. The CNC Wood Router from Advanced Machinery is what you require. One of the most looked for models presented by Advanced Machinery, it comes equipped with a vacuum table in addition to with a sealing ring. It is easy and favourable to use and has the capability to hold any volume material with the touch of a button. In fact, if you want to create furniture or any other complete wood work, all you need to do is manually alter the tool and you are good to go. It is simple to use and is developed to give a immaculate finish to all your work. Or make contact with on 0825089977 if you have any queries about our item or its accessories. You will be amazed by some of the enticing and awesome features that this CNC Woodworking Routing Machine boasts. It comes with an good dust collection system which takes care of all the dust that is made in the process of engraving and cutting wood. The spindle is brushless and offers water cooling. You have the range of 7.5kW spindles for 2000×3000mm size work tables. It makes use of the ER collet system which is known to be the most widely preferred clamping system known to man. ER25 is the collect size utilised by this router. We also offer you four different collet sizes and adapters free of charge. That is definitely a bargain! The driver motor is a Hi-Torque 1.8 degree stepper motor with a rated torque of 3.5 N-m. It has a manually centralized lubricating system. This means that you just need to push the lever after filling the oil tank. Making the maintenance of this machine easy. Before purchase any other products, do not regret later for NOT choose our products. for CNC Routers, Vinyl Cutting Machines, Laser Cutter, Plasma Cutting Machines and many more.